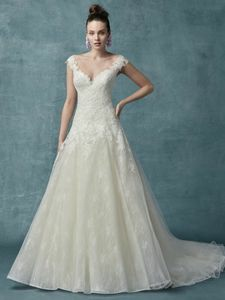 Description: This lovely lace wedding dress features a dropped-waist bodice accented in soft lace motifs atop a ballgown skirt comprised of tulle and allover lace trimmed with narrow horsehair. Soft lace adorns the illusion V-neckline, illusion cap-sleeves, and illusion V-back. Finished with covered buttons over zipper closure.